He's fairly conservative (a Trump supporter) and recently created a post on Facebook that likened Hillary Clinton to Hitler. One of his friends reported the post to Facebook, and Facebook removed the post from visibility, labeling it offensive. I may not agree that Hillary is effectively Adolf Hitler, but it seems firmly within this guy's rights to compare political candidates to Hitler. In fact, there's nothing really more American than comparing people you disagree with to Nazis (there's even a social-science internet law about this). I see people compare Donald Trump to Hitler all the time. Literally... all the time, with no apparent repercussions. Is there a double standard on Facebook in comparing Hillary to Hitler? This is especially interesting to me considering Facebook's reported bias against conservatives (which they blamed on rogue employees). The most common term, by far, used when discussing Hitler is "Trump." Right now, there are only really two Hitler related topical discussions on Twitter: one related to Trump and the other pertaining to Syria. I downloaded the last ten days of tweets (all tweets) containing the hashtag "#Hitler," which was around 15K total tweets. I ran a cleanup algorithm I designed to remove tweets that contain duplicate content, likely tweetbot posts, and spam. The result was about 3,500 clean tweets that mentioned Hitler and were unlikely to be spam. Then I conducted some text-data cleaning steps, you can look at some prior posts on this site to understand what this entails, but generally it removes frequent words that are less meaningful (e.g. "the") and reduces words to their stem, or root meaning (e.g. "run" and "running" are interpreted the same way). What are the general topics of conversation regarding Hitler? 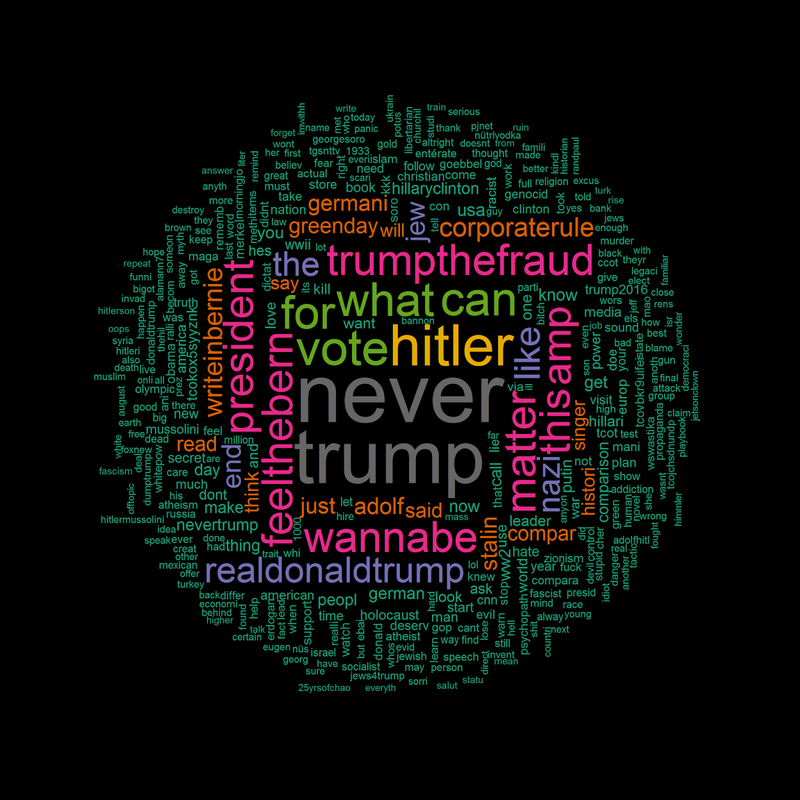 The first part of the analysis was easy, and I found that Tweets with the term "Hitler" most often use the word "Trump" followed by a series of words related to elections including "like" and "support." Terms related to nazis are also popular, specifically, "adolf" and "nazi." 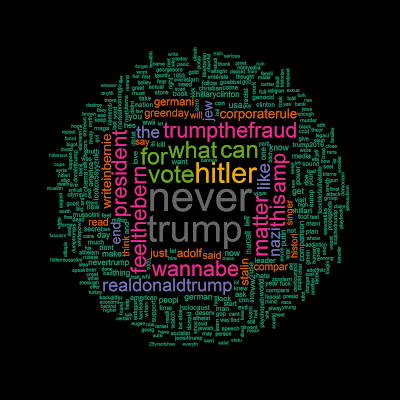 Of note, "Hillary" or "Clinton" aren't in the top 20 terms associated with Hitler, though Trump's Twitter user name is, as well as marginally associated words "never" (as in never Trump) and "vote." Searching the data, Hillary was mentioned about 90 times in the data set, so Hitler tweets are only about 12% as likely to contain Hillary as they are to contain Trump. One might argue that Trump supporters are also mentioning Hitler, but the term output makes it more clear who is invoking Hitler and Trump. It is generally the "Never" Trump movement as evidenced by the terms "Never" and "Trump The Fraud." 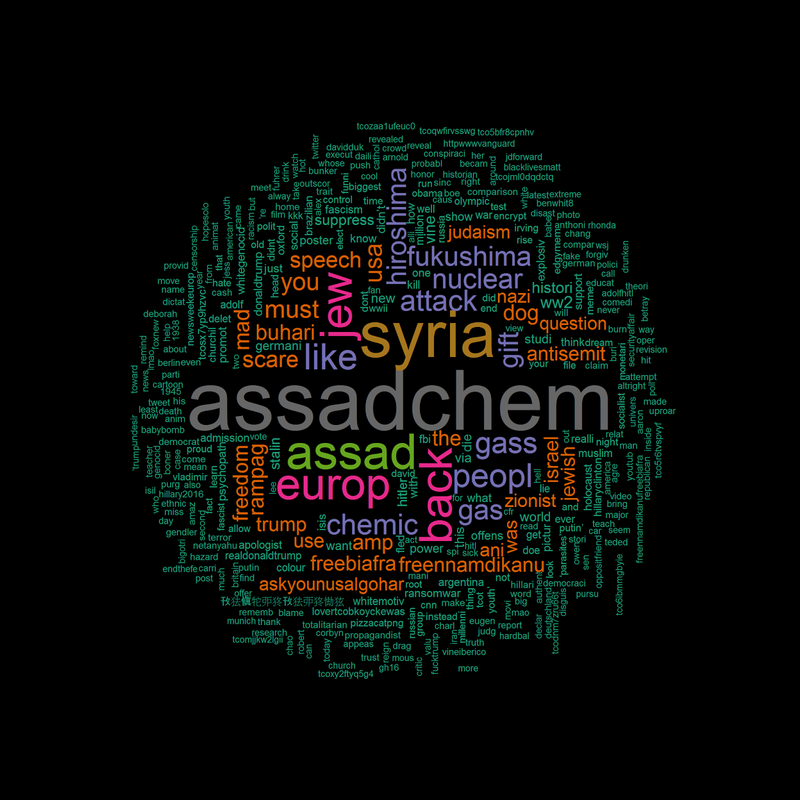 For a bit more color, here are the associated wordclouds from each topic. The most common topic discussed on Twitter when using the term Hitler is "Trump." Users seem to continuously make the comparison of Trump to Hitler, without being punished by the social media platform. 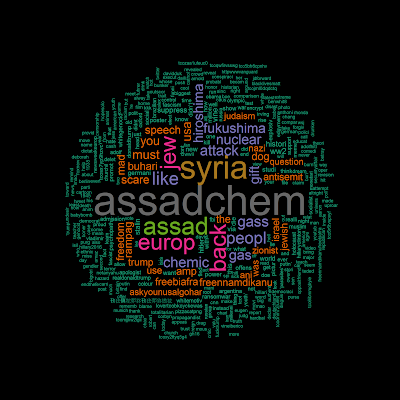 The main two subjects of discussion when talking about Hitler on Twitter appears to be Trump and Assad. This isn't hugely surprising about Assad given recent news out of the middle east. The Trump comparisons to Hitler, is a bit more jarring, given that he is the Presidential candidate for a major US party. QUICK COMMENTARY: The guy with the banned post from the beginning of this entry just posted that he challenged the banned post with Facebook, and Facebook gave in and said that it was in fact appropriate. This is interesting, and it tends to coincide with previous articles stating that individuals at Facebook who receive front line complaints are often biased against conservative views, and tend to over-extend censorship towards conservative positions. Obviously, I looked at a different social network, but it is commonplace to compare Trump to Hitler, so it seems like the Hillary to Hitler comparison shouldn't be censored. Over 10 years ago huge online companies like the mighty Microsoft with MSN, then Yahoo! and even the newly rising industry giant Google all saw a rising need for social networking websites. They knew that the wave of the future was in the growing popularity of social networks. Thanks a lot for this amazing article ! Another good idea is to add your Twitter Handle to an RSVP linky list if one is provided in the party announcement post. RSVP’ing is often optional, but a great way to get people – including the party host – to follow you. If you want to find out how to have prospects banging down your door asking about you and your business opportunity then I recommend getting a copy of the course Magnetic Sponsoring. This is the best course in the industry that teaches attraction marketing techniques. In order to cater some needs of users, the R&D team did many researches and had successfully added a new function for this desktop app that allows users to follow soundcloud plays user realizing checking updates of single soundcloud plays user which brought good news to soundcloud plays music listeners and appreciators. Hi definitely there, yes this paragraph is in fact definitely beneficial and also I invite reality found deal of elements from it fretting blog website developing. many thanks.